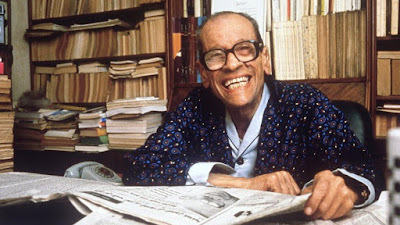 Naguib Mahfouz was born on December 11, 1911 to a lower middle-class Muslim family in the medieval Fatimid quarter of Cairo in Egypt. Mahfouz was the baby of his large family – his parents, Abdel-Aziz and Fatimah Ibrahim had six other children before him. The Mahfouz family were extremely devout to the Islamic traditions and customs, and Naguib often spoke of his strict upbringing. Mahfouz was a seven-year-old at the time of the Egyptian Revolution of 1919 and it had an enormous effect on him as a writer and a person, shaking the security of what was the Egypt of his childhood. In 1930 Mahfouz was admitted to the Egyptian University, later renamed Cairo University, where he studied philosophy. After graduating, he worked in various government ministries until his retirement in 1971. 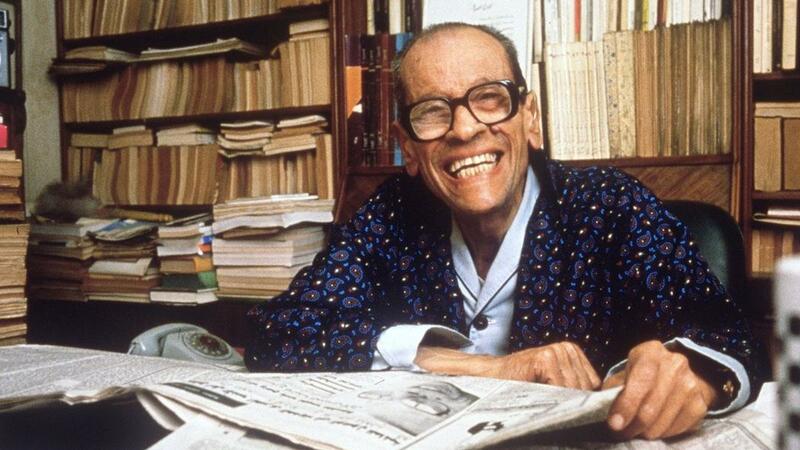 Mahfouz then worked as a journalist, before his own writings received enough notoriety to feed his family and pay his rent. He wrote prolifically, publishing thirty-three novels, sixteen short story collections, several plays, thirty screenplays, and a variety of other works of non-fiction over his 70-year career. He was an outspoken advocate of peace between Egypt and Israel, a position that made him a controversial figure in his homeland. An assassination attempt in 1994 shocked to country, when an Islamic fundamentalist stabbed him. 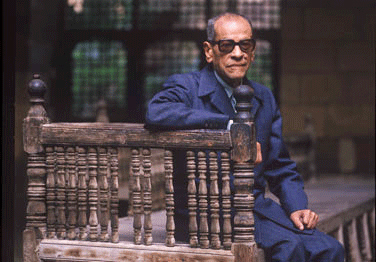 Weakened by age and debilitated by the attack, Mahfouz was unable to write longer pieces in his later years. He began to compose extremely brief, dream-based vignettes. 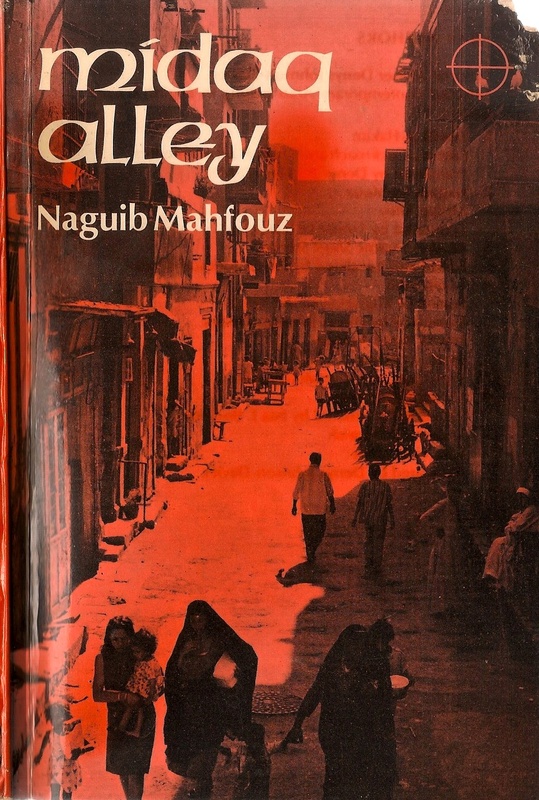 When We Met: Another author I admired, Augusten Burroughs, was interviewed and remarked how he would have not read Naguib Mahfouz’s Midaq Alley if he hadn’t seen the cover. Curious as a cat, I chased it down and read it. It was amazing. It was horrific and wondrous, challenging and poignant. It was so well-written that I could not stop reading Mahfouz. On a ministry trip to Cairo I bought the Cairo Trilogy and devoured all three. The more I read, the more I wanted. Some authors deliver more than a story – they bring a microcosm of their world in a tale. Mahfouz is one of those. Why He’s Good: Mahfouz has a way of taking the complicated history of modern Egypt and making it easily digestible for foreigners. As he paints a picture of Egypt, Mahfouz patiently weaves the stories of the obviously oppressed and the not-so-obviously oppressed. 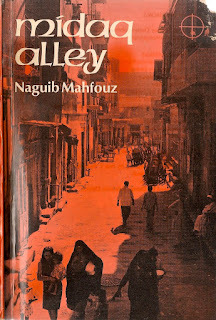 Mahfouz tells what he sees –and it is easy to understand how Egypt’s alleys can hold a myriad of tales. Some people refer to him as the Arabic Charles Dickens, portraying characters with such intricate detail that you hope that no harm will come to them. When you’re in that attached, heart-rendered place, something happens that takes your breath away. Mahfouz is half literary genius and half artist. Plot Variations: Three generations of the family of a tyrannical patriarch reveal secret lives, dreams and incorrigible self-indulgence. Citizens inside of a modern Cairo neighborhood unwittingly reenact the lives of their holy ancestors. An orphan raised by a foster mother, is drawn into prostitution. A former thief returns home from prison only to find that his beloved wife and his trusted henchman had conspired to betray him to the police so that they could marry each other and keep his six-year-old daughter from him. Buy One: Since The Cairo Trilogy--Palace Walk, Palace of Desire, and Sugar Street— is three, it cannot be on the “buy one” of Mahfouz’s list. I recommend the terrible and wonderful Midaq Alley – a tale of good and evil and a tragic heroine that is (almost) redeemed by love. Surrounded by crime and broken hearted, Hamida, an orphan raised by a foster mother, is drawn into a life of prostitution after her true love leaves. A cafe in the alley, is a drug addict and a lustful homosexual. Zaita makes a living by disfiguring people so that they can become successful beggars. Transcending time and place, the social issues treated here are relevant today. Midaq Alley available here. Trivia: Mahfouz was named after the Coptic physician who delivered him, Naguib Pasha Mahfouz. Utterly ridiculous beautiful irony: Mahfouz gives us a world that cannot collapse-and then does. He paints us a picture that is too beautiful to be destroyed, and then pulls us away as it is slashed before our eyes. The author of many lines I remember later, in an ache, I love his staying power. The highest compliment I can pay to any author is that they write“utterly ridiculous beautiful irony,” which Mahfouz does - every single time.